Disclosure: I was given a premium pizza crisper from Crate and Barrel, an Oxo stainless steel pizza wheel, a Halloween-themed spatulas, pot holders from Sur la Table, a basket of Fleischmann’s Yeast, 2 Karo Syrups, and 6 Simply Homemade varieties, plus the same gift basket of these products for a giveaway to one of my readers for this post. Each at a value of $75.00. What you see above is part of what you can enter to win! The pizza pan, pot holders, and pizza cutter! So we lost a bit of the shape in the ghost cheese and pizza, but so what? But my brother and I had so much fun doing this and spending time together, which is what matters. Now lets get to Baking a Difference! The challenge was to make a pizza for Halloween, a spooky pizza, if you will. I got to brainstorming, and it was quite simple what followed. 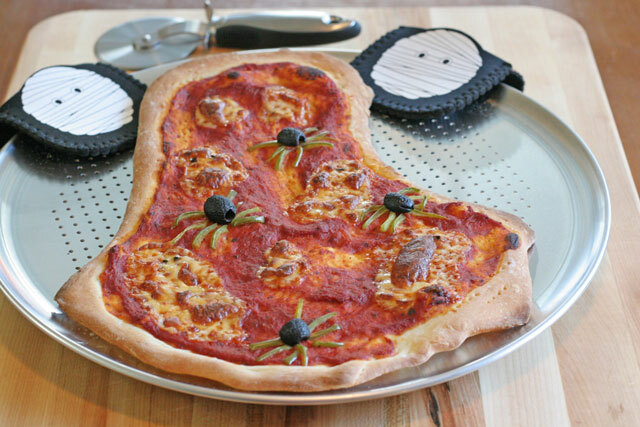 Have fun playing with homemade dough and make spiders out of healthy low cost ingredients. Olives, bell peppers, and a bit of cheese, off we go! My brother joined me in the kitchen, he made the legs, I made the cheezy ghosts. We had fun, and that is what matters. Getting family, friends, and kids into the kitchen in any way is the most rewarding time spent for me. 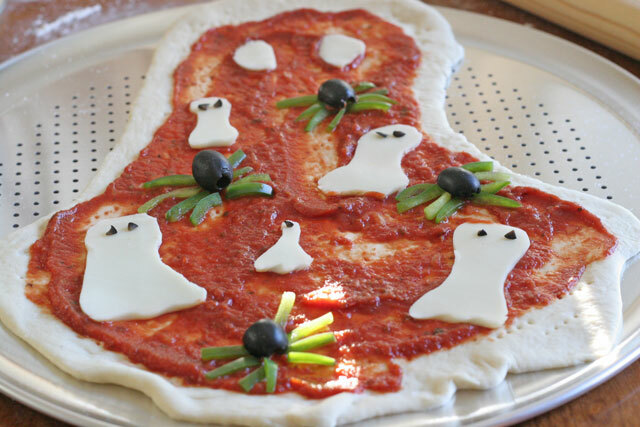 We had a blast making silly spooky pizzas for this post. I wanted to keep it simple, so the kids, adult and small, can let loose and be creative while making a nice meal together for this Halloween, or any other fun holiday. I baked a difference, I made spider pizza, as an adult with no kids, and it was worth every cheezy laugh we had. How I am helping… I joined No Kid Hungry alongside Joy the Baker, who has teamed up with Fleischmann’s and Karo Syrup, by Baking A Difference in my kitchen by coming up with a spooky pizza recipe. 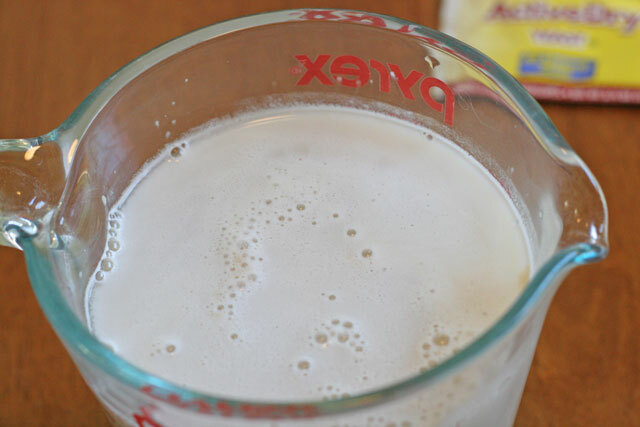 So I chose to go with a kid friendly, have fun recipe for the whole family to participate! This year, Fleischmann’s Yeast, Fleischmann’s Simply Homemade Baking Mixes and Karo Syrup – trusted baking products that have been kitchen staples for more than 100 years – are launching the Baking A Difference campaign to benefit Share Our Strength’s No Kid Hungry campaign to help end childhood hunger in America. 1. Combine the flour, sugar and salt in a bowl, whisk together. 2. 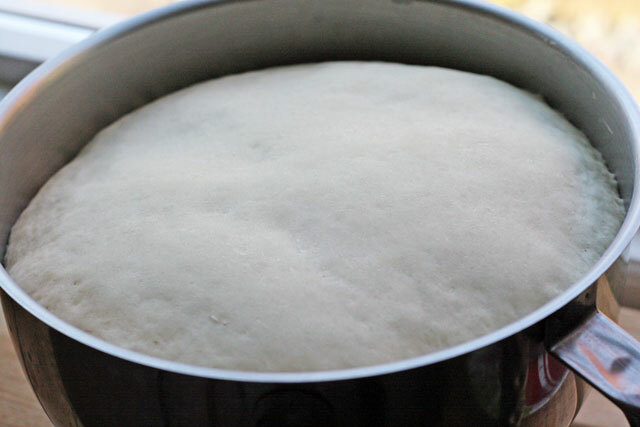 Add the yeast to the 105-115 degree water, let it sit for about 10 minutes until frothy and bubbly, like below. 3. Add the yeast to the flour. I used my stand mixer fitted with a dough hook, and mixed on 2nd speed for 10 minutes. 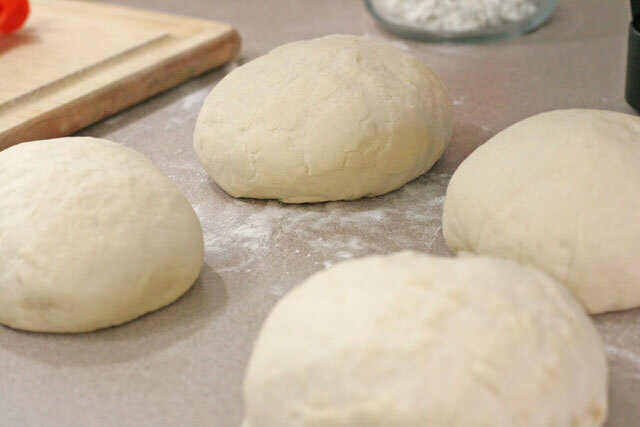 You can also use you hands to work the dough on a lightly floured counter for 10-15 minutes. Tip: Heat your oven to it’s lowest setting, mine is 175 degrees, turn it off once it heats to that temperature, and use as a proofing box. The only time I do not do this is when it is hot weather. 1. Roll out dough into any shape you like, I did a ghost with my brothers help. 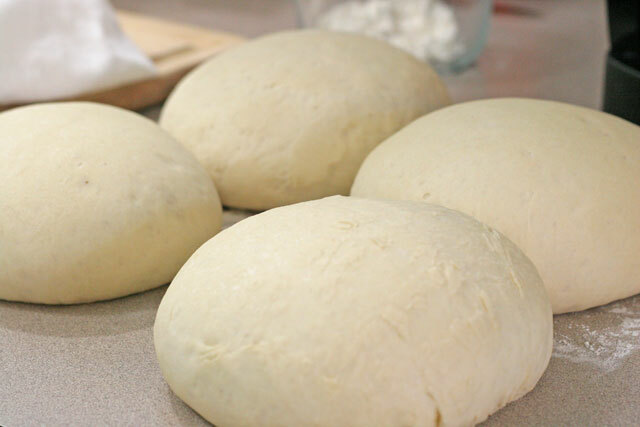 Once rolled out into desired shape, place on baking sheet or pizza pan. We made spider legs out of bell peppers, the body out of olives. I cut ghost shapes out of the pre sliced cheese, and had so much fun. So have fun and be creative, it all works here! Place pizza sauce on raw dough and spread evenly, about 1 cup for each pizza, then add cheese shapes, spiders, or whatever you came up with! 5. 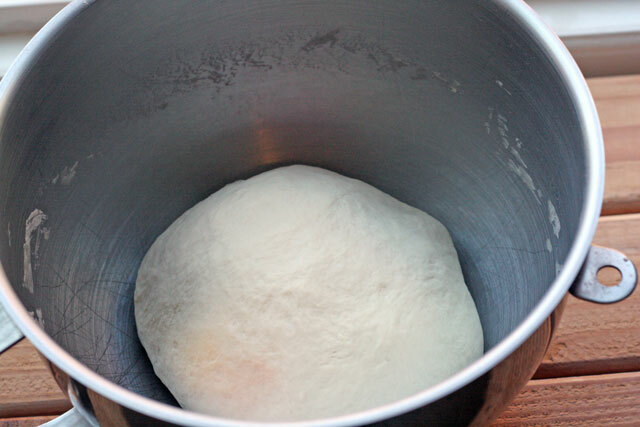 Place pizza in the oven for 10-15 minutes. A basket of Fleischmann’s Yeast, 2 Karo Syrups and 6 Simply Homemade varieties, including the new Pretzel Creations, to help you get baking. The winner has been chosen. 1. Simply tell me in the comment section below what pizza creation you’ll be baking with these goodies? I also, by making this pizza creation, get entered for a chance to win a spot in the cookbook with six other bloggers! I will choose a winner at random on Tuesday October 29th at 9am and overnight you the package, so you can get baking! Please keep an eye out on your inbox. If I do not hear from the winner by 5 pm, a new winner will be chosen. Disclosure: I was given a premium pizza crisper from Crate and Barrel, an Oxo stainless steel pizza wheel, a Halloween-themed spatulas, pot holders from Sur la Table, a basket of Fleischmann’s Yeast, 2 Karo Syrups, and 6 Simply Homemade varieties, plus the same gift basket of these products for a giveaway to one of my readers for this post. Each at a value of $75.00. I would love to make a homemade pizza with garlic green olive tampanade for slimy effect and decorate them with scary mushroom moths and cheese webs! I love the ghost pizza idea. My son saw the spiders and said, “Oh, they are so cute!” We are making a pumpkin shaped pizza using the topping to create the face for dinner on halloween. Damn. That sounds amazing! I love caramelized onions on my pizza.